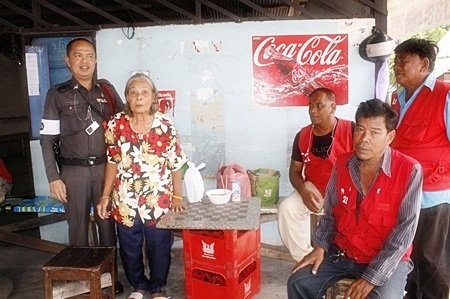 Big-hearted taxi drivers came to the aid of a 67-year-old grandmother kicked off a Rayong-bound bus because she couldn’t pay the fare. La-ong Aramsuwan of Sriracha was unceremoniously booted from the Bangkok commuter bus on Sukhumvit Road July 22. Motorbike taxi driver Vim Chanhorn, 53, sat at his station, mouth agape, as a young bus boy unloaded the woman’s suitcases, climbed back aboard the coach and left her on the roadside. Petrified, La-ong fainted and fell. A kind-hearted citizen comforts La-ong Aramsuwan until help arrives. It turned out La-ong didn’t have even a single baht on her. She is alone in the world, her children having left long ago. She didn’t know where she wanted to go, except that she had to pick up her social security payment in Bangpra. Smack in the middle of Pattaya, she was far from home. Vim and some other motorbike drivers chipped in what cash they had and gave the grandmother water, some food and a place out of the sun. They then contacted the Sawang Boriboon Foundation, which took her to the Banglamung Home for the Elderly, where they tried to contact relatives. Police officer Ngernpruen Boonserm, who responded to the taxi drivers’ call, said leaving senior citizens in such a manner is a sin and he thought children who cannot take care of their parents should contact authorities to arrange for someone who can. Police officer Ngernpruen Boonserm (left), motorbike taxi driver Vim Chanhorn (right) and friends assist La-ong Aramsuwan (2nd left) in her time of need.